Fountains in front of city hall turned up too high. Not windy today, this is just high water volume. Meanwhile, the fountain up by the Capitol has no water at all. Come on, DPW. Show us some love. The fountain by the Capitol (Corning Fountain) is awaiting repair, the basin is cracked. Request #86194 was sent to DPW for this issue. No trash can in entire block of new bus stop hub. Reported this 2 months ago. Issue closed with no result. Request #86191 was sent to DPW for this issue. I also informed DPW administration office. Request #86098 was sent to DPW. There is no pedestrian signal at this intersection. 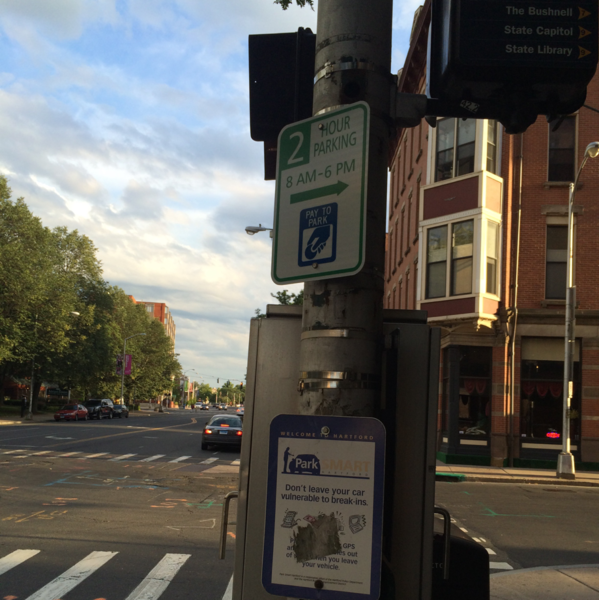 None of the infrastructure works to alert motorists to pedestrians, nor gives pedestrians the right of way. Request #85468 was sent to DPW to attend this issue. Request #54421 was sent to Public Works to place this sign. Thank you for contacting us about this issue since it is clear that it can mislead people thinking they can park without paying. However, just some insight, parking in downtown that requires you to pay are from 8am-6pm on weekdays, any time/day after that its free unless a ban is in effect or a special event is taking place. 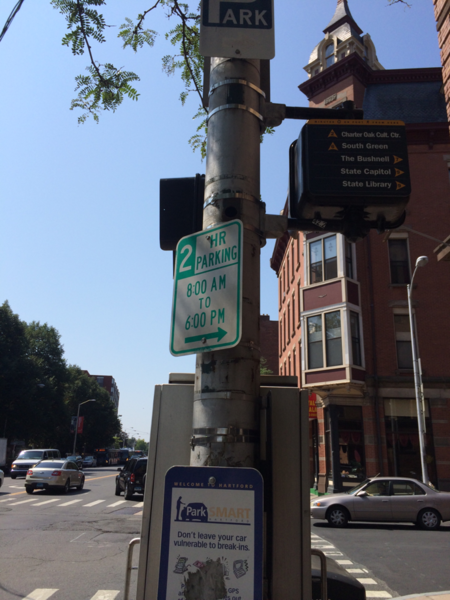 This is still an issue, the "pay to park" sign is still missing. This is still an issue. Given that these parking spaces are very near the Federal Building, most of the people who park there are from out of town and may not be aware that you have to PAY to park for 2 hrs btwn 8am and 6pm M-F. They see a sign that says "2 hour parking" but they see NO sign that says "PAY TO PARK", so they park and go on their way. Then they come back to a $25 ticket, and then they have nothing good to say about Hartford. All for lack of a sign. I first posted this item in June of this year. It has now been 4 months. Which department is responsible for this? HPA? DPW? It's not very big, but at least it now says "pay to park". Thank you! What's the story with the fountain? There's no water and it's got litter in it. Summer is here, people! Get it together! Request #85523 was sent to Public Works to attend to this issue. My thanks for your quick response. Meanwhile we all have to ask why local citizenry are required to prime the pump on behalf of basic maintenance. DPW, please let us know if the city is unable to oversee what's happening a few steps from the Capitol dome. Can you specify what the issue is? Is a street name sign missing? Adding more details would help in this case since the picture does not show much unless you are referring that their something wrong with the Traffic Signal/Light. Request #84875 was sent to DPW. Massive graffiti on the Royal Masala restaurant, Capitol Avenue side. This was probably not a protest over their awful new neon beer signs, but you never know. Request #84865 was created to attend to this issue. Request #84743 was sent to DPW to attend to this issue.